Two new sites have been put forward for housing development in Reepham as part of the Greater Norwich Local Plan (GNLP). Eight potential housing sites around the town were consulted on in early 2018. Constraints identified for this location include the capacity of the local road network, site access, lack of footpaths, flood risk, townscape impacts and loss of Grade 2 agricultural land, although “it may provide an option if higher levels of growth are required”. 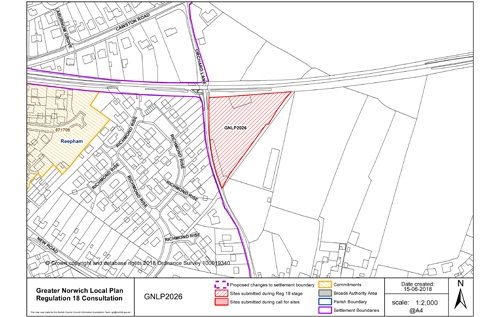 A smaller (0.63 hectare) site (GNLP2026, below) has also been put forward for five houses to the east of Orchard Lane and south of Marriott’s Way. Constraints identified include site access, the capacity of the local road network, townscape and ecological impacts. 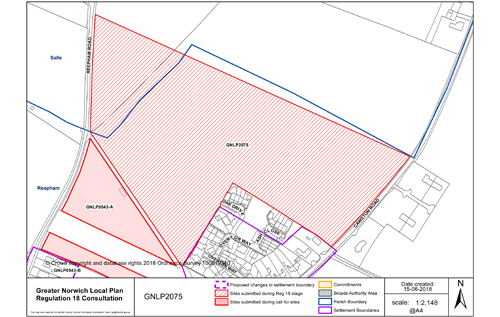 New sites have also been proposed for Cawston (Heydon Road – mixed use development including 30 dwellings, care home and commercial units), Foulsham (The Hawthorns – 5-6 dwellings), Great Witchingham and Lenwade (Bernard Matthews south site – 150 dwellings), and Heydon (off The Street – 5 dwellings; West of Earle Arms pub – 15 dwellings plus new water treatment works). A public consultation on all the new, revised and small sites for the GNLP commenced on Monday 29 October and will close at 5 pm on Friday 14 December.